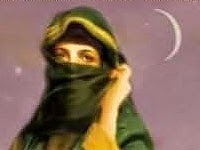 She journeyed to Syria and witnessed its opening to Islam with her brother Abu Hashim and her husband Aban ibn Sa'id. She was widowed on the day of the Battle of Ajnadayn. It is said that they were together no more than two nights before she was widowed. Another version says her husband who was killed was Yazid ibn Abu Sufyan. When she was widowed, 'Umar proposed to her and she rejected him. She was asked "Why?" She said, "When he enters, he enters sternly and when he leaves, he leaves sternly. He is preoccupied by his Hereafter from his worldly affairs, as if he were staring his Lord in the eye." Another version has it, "He enters frowning and he leaves frowning. His doors are closed and his giving is little." Then Zubayr ibn al-Awwam proposed to her and she rejected him. She was asked, "Why?" She said, "A wife gets nothing from him but chores and work to secure his needs. And he says, 'I did this' and, 'I did that', and 'I am this', and 'I am that'." Then Talhah proposed to her and she said, "Marry me, truly." People said, "How is this?" She said, "I truly know his moral character. When he enters, he enters laughing and when he leaves he leaves smiling. When he is asked, he gives. When I withdraw, he inquires; when I work, he thanks; and when I do wrong, he forgives." 'Ali was visiting them in their home and he said [to her husband], "Abu Muhammad, may I speak to Umm Aban?" He said, "Speak to her." 'Ali said, "As-salamu alayki, oh woman who is dear to herself." She said, "Alayk as-salam." He said, "The Leader of the Believers, Chief of the Muslims, proposed to you and you rejected him." "And I proposed to you and I am from the Prophet and you rejected me." In another version, 'Ali added, "You refused all those whom you refused, and married this son of the daughter of Al-Hadrami." She said "Decree and destiny." 'Ali replied, "You know, you married the one of us who was most beautiful of face, the one with the best hand, and the one with the most goodness toward his family."